Bargain Shopping Paradise: Fabulous Photo Giveaway winner! And the winner is . . . comment #16, Deb! Congratulations! 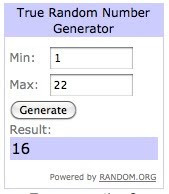 Thanks for entering, everyone! It was great to see all your wonderful comments, and to know that I've got some really great followers. Feel free to stop by, share your ideas, link-up, or enter future giveaways. I love connecting with you all over our love of bargains! Have a wonderful weekend.